The only element that I often missed was the fact that the paper didn’t always look that realistic at the end. So I started studying old paper a bit more up close and I’m really glad I can share my results and ideas with you. Now what is wrong with most paper aging tutorials? The idea of completely crumpling paper and then dyeing it. Most of the time aging paper doesn’t get crumpled much in the middle (unless you speak of your kid-in-puberty who has a severe lack of understanding the concept ‘putting things in a folder’). Paper first of all gets torn and crumpled at the EDGES. This tutorial shows you how I love to age my paper and my secret (not) paper edge aging tool. 1. First dissolve the instant coffee in about half an inch of water in your container. You would want to use enough coffee to add color. 2. 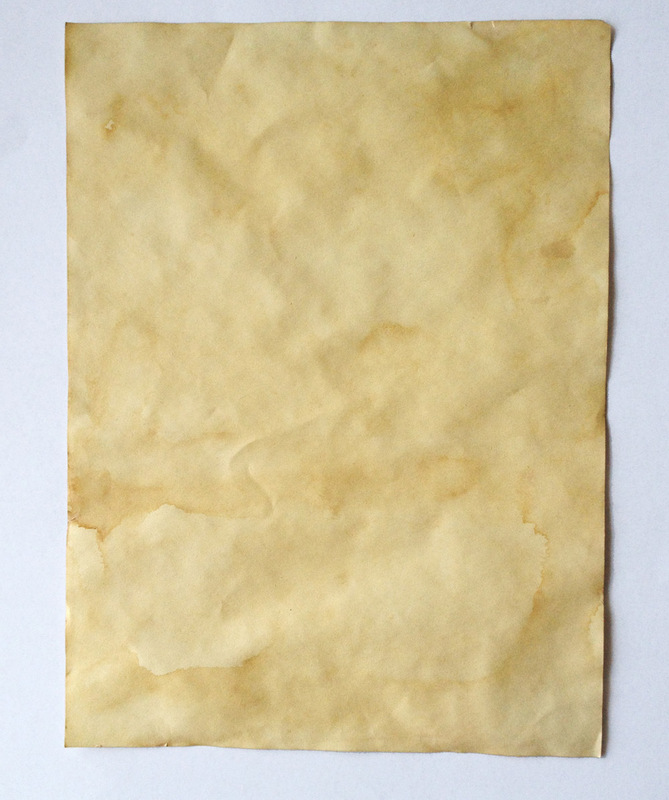 Soak a piece of paper completely in the coffee solution. Use your fingers to make sure every inch of the paper is merged into the water. Turn the piece of paper around and soak it again. 3. 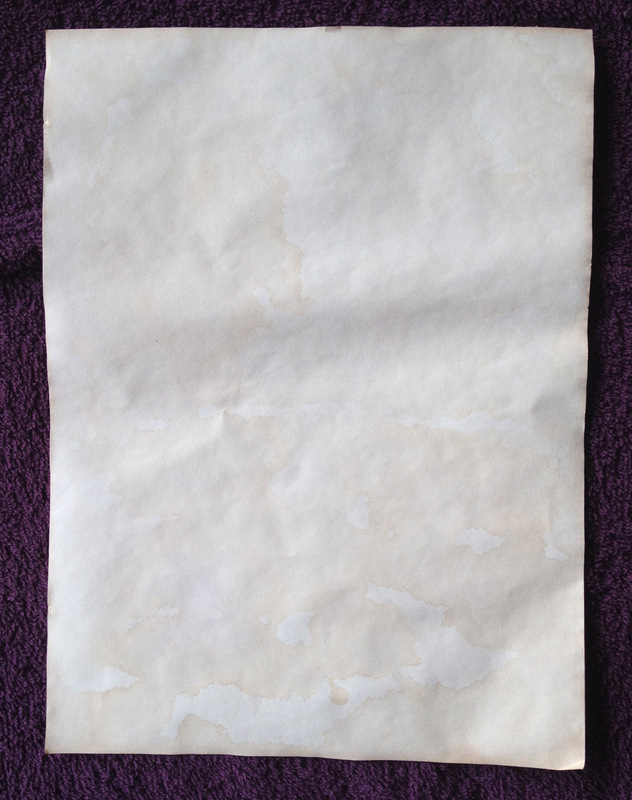 When you’re sure the whole back and front surface of the paper is covered with the coffee mixture get the paper out and let the excess moisture drip off the paper. 4. Place the wet paper on the towel. You can leave the paper to air dry, or get your hair dryer to speed up the process. Using the hair dryer you can play around with the excess water on the paper to create interesting patterns. 5. Now repeat the process over and over again until you’re happy: soak – dry – soak – dry – soak – dry – … You can also soak only parts of the paper (like, for instance, the edges) to create color stains. When you’re happy with the color and stains on your paper and your paper is completely dry it’s time to tackle the edges. Chances are the edges are already a tiny little bit crumpled from your soaking action. Great! 6. Place your dyed piece of paper on the edge of a table. Let half an inch stick out over the tabletop edge. Place a bunch of books on top so that the paper won’t be able to move. 7. Take your mini whisk and put the paper edge between the wires. 8. Now start sliding the whisk over the whole length of the paper edge, distressing the paper as you go. From time to time, take the paper between your fingers and with the other hand start batting the paper right next to your fingers, this makes it tear in a natural way. (You’re actually mimicking the natural distressing of the paper’s edges but in a high speed instead of over the course of years).